MANILA, Philippines (CNS) — As Filipinos remembered their departed on All Souls’ Day, the country’s church leaders called on the faithful to also pray for those who fell victim in the government’s all-out war against illegal drugs. “More so, for those who died in violent circumstances,” the priest added. “We pray for the forgiveness of their sins, we pray for the repose of their souls, and we pray for their redemption,” Father Secillano told ucanews.com. “(We) humbly accept our share of shortcomings with regard to forming our consciousness and behavior in confronting social maladies,” he said in a pastoral statement Oct. 30. Families affected by drug-related killings will, however, not be able to properly honor the memories of their slain loved ones this All Souls’ Day. 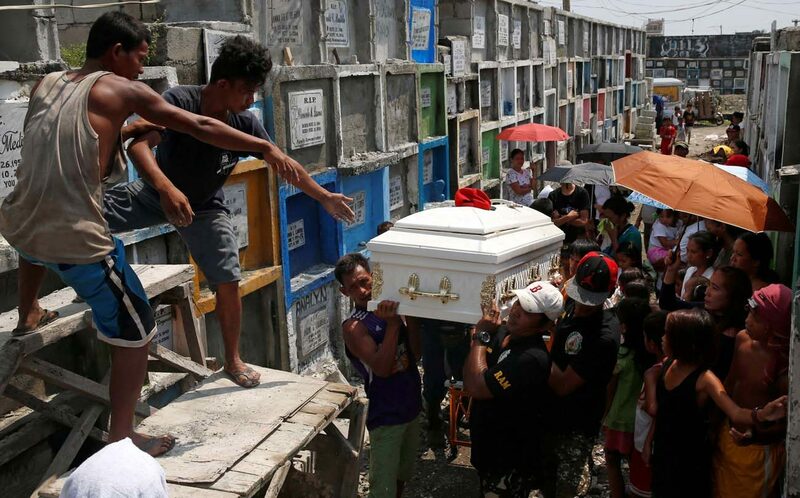 “Many are afraid that they too will become targets, while others do not have enough money to claim bodies from funeral homes,” said Gloria Arellano, chairwoman of Kadamay, a coalition of urban poor organizations. Most victims of summary executions come from urban poor communities in the Philippine capital. Hundreds of bodies were reported to be unclaimed in funeral homes in metro Manila. Arellano said the cost of burying the dead is also beyond the reach of most poor families. She said a proper wake and funeral can cost about $1,000. Archbishop Socrates Villegas of Lingayen-Dagupan earlier expressed “grief” about the violence that has marked Philippine President Rodrigo Duterte’s war against drugs. “In our dream to wipe out drug addiction, are we not becoming a ‘killing fields’ nation?” he said in a statement in August. Catholic parishes around the country planned to celebrate Masses for victims of summary executions. The Philippine National Police has reported 2,766 unexplained killings allegedly carried out by vigilantes as of Oct 23.